Eastern Virginia Orthotics & Prosthetics (EVOP) brings more than 20 years of experience to patients in need of prosthetic limbs, braces and more. We are personally committed to helping our patients regain mobility and get back to leading a fulfilling life in the most convenient manner possible. Located in Suffolk, we serve the Hampton Roads area of Virginia and some parts of North Carolina. While many other companies aren’t willing to go to great lengths to provide the best service to their clients, we are. Our company chooses to be different. 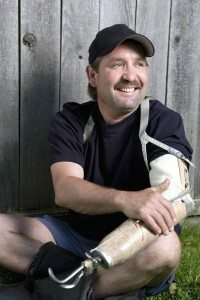 We understand the challenges that come with the unique needs of orthotic and prosthetic patients. Thus, our services are designed to be personable and convenient. By traveling directly to the patient, they receive services in-home without having to find a means to drive or get a ride to a specialty clinic. From lower extremity braces to permanent limbs, EVOP provides comprehensive services tailored to the clients specific situation. In addition to our Competent and Convenient services, our staff has numerous qualifications to best serve you. We are board certified with the American Society of Orthopedic Professionals and BOC. Each of our friendly specialists come with knowledge, passion and experience that help patients overcome challenges and live their lives in confidence. Take control of your care solutions and receive support right in your home with EVOP. For more information, please contact us through our web form or call 757-850-2835. For more than 20 years, EVOP has been delivering "user friendly" services to patients in need of orthotic & prosthetic services. Read on to learn more about our company and our values.